People who are guides, therapists, agents of change, holders of space, facilitators, coaches, healers, and so forth are familiar with the word “transformation”. We hear it in workshops, read it in self-help books, and banty it about in conversation. Transformation sounds lovely. We say that we want to transform our lives, to become better people. To have a word for it — transformation — makes it sound easy. Is it? In a group experience a few years ago, post-Jungian analyst Marion Woodman declared to all of us, “There can be no transformation without sacrifice. What are you willing to sacrifice in order to transform?” The room got very quiet as we chewed on this, not entirely liking it, yet knowing in our guts that she was right. To transform is to change into another form of energy, to transmute into another substance, to undergo a radical alteration, to be stripped and rebuilt. Reflect on the myriad myths of death and resurrection. Trump 13’s Great Reaper in the tarot. Think about Scorpio’s penchant for elimination and total transition. Pluto’s power to slurp us into an underworld inititiation. Not always pretty or elegant, but certainly thorough. To transform takes courage, or at least a willingness to keep journeying without always knowing. Let’s be honest; not many of us would call out, “Hooray!” if Life said, “OK, I’m going to dismantle you piece by piece, throw out what doesn’t work, keep bits of what does work, knead you like a lump of dough, then gradually construct your real self.” I’m not sure that it’s about becoming a happier person, but it IS about becoming a more authentic person. Transformation is noble work; therefore, it deserves to be rescued from buzzword hell. By all means, let’s transform, but let’s do so conscious that it’s not all bubbles and roses. What are we willing to sacrifice in order to truly transform? Using the Rider-Waite-Smith tarot deck, I asked, “What is transformation?” and received the Hierophant, reversed. This suggests to me that transformation is a deeply personal initiation ritual and a time-honoured tradition that we carry in our personal and collective psyches. Please leave comments and questions, my friends. Let’s have a conversation about transformation. On Thursday evening, five of us gathered to explore how Birth Cards, Year Cards, and Month Cards from the tarot might interact to offer us insight and guidance. We employed many parts of the brain by using simple math, wordplay, crayon drawings, and story. All three types of cards are derived from one’s date of birth. There are different ways of calculating these. For Birth Cards, I currently use the system taught by the Tarot School of New York. For Year Cards, I have recently developed my own means of calculation that seems to be very accurate and relevant. Month card calculations are my own too. 1 + 1 = 2 The second Major is the High Priestess, so it’s also one of my Birth Cards. Both of these are mine for a lifetime. 45 + 101 = 146 14 + 6 = 20 The twentieth Major card is Judgement, also known as Aeon or Awakening. So, for one year, from my last birthday to the next, my Birth Cards — Justice and Priestess — are wearing the costume of Judgement. It’s as though the lifetime qualities wear Year Card-coloured glasses for 365 days, then changes them when the next birthday arrives. 33 + 101 = 134 13 + 4 = 17 therefore my Month Card at the moment is the Star, the seventeenth Trump card. Our wordplay on Thursday evening first consisted of listing qualities we noticed in each of the four cards we came up with via the math. My own included the following. HIGH PRIESTESS: spirituality, intuition, altered states, meditation, deep feeling, non-verbal Knowing, Dark Feminine, connected with Universe, tuning in, keeper of mysteries. 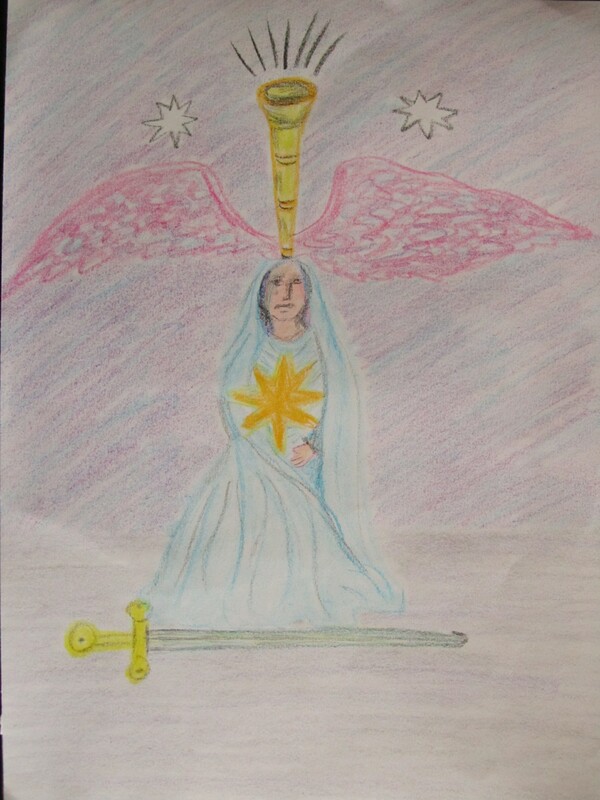 JUSTICE: balance, justice, fairness, peace, objectivity, reciprocity, equality, legal matters, equilibrium, stability. JUDGEMENT: evolving, maturing, moving one, rite of passage, growing up, progress, entering the next phase, liberation, awakening, true calling, upgrading, stepping over the threshold. STAR: resources, abundance, plenty, grace, generosity, directing the flow, in the flow, astrology, ease, humility, the means are at hand, a legacy that shines on. This month, the legality of tarot reading can progress by working with it easily and gracefully. This month, the Dark Feminine awakens a sense of justice in me through generous reciprocity. This month, objective non-verbal Knowing can be upgraded through astrology. This month, the long-shining legacy of my true calling is in harmony with my spirituality. This month, my abundance is stabilised by stepping into my next level of intuitive awareness. Summary: I experience graceful evolution by meditating on peace. Action/Ceremony to Do: Play “Dona Nobis Pacem” on Jaiya‘s Invocation CD and chant along with it while offering healing energy to Mother Earth. Imagine taking an hour or two each month to blend our Birth Cards, Year Card, and Month card, then aligning ourselves with that by performing simple actions. We’d be more in harmony with our True Selves and with the Cosmos. Blessed be! 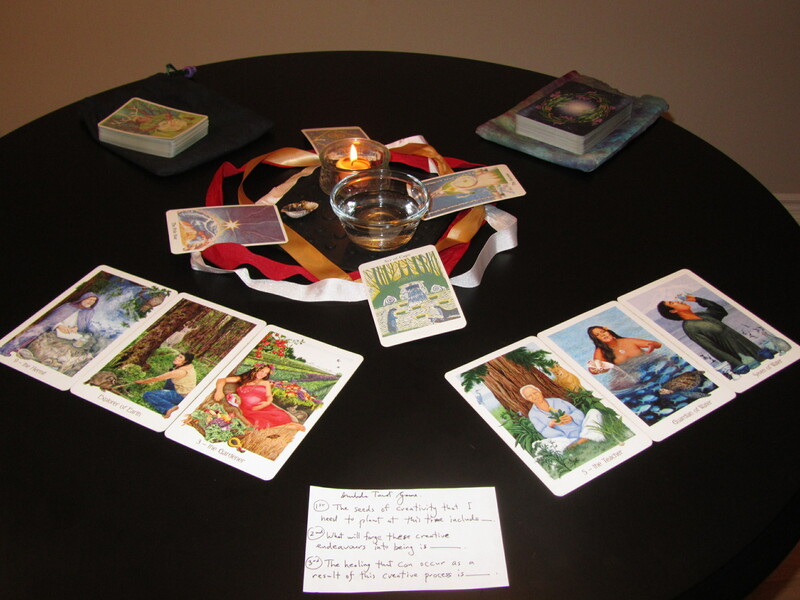 I’m thrilled by people’s response so far to the October Gaian Tarot Retreat. One-third of the spots are now taken and it’s only mid-February. The Earth is aching to be heard and people yearn to be connected with one another to better hear Her. It’s simultaneously exhilarating and humbling. I drew a card from the Gaian Tarot to respond to the question, “What is so invitational about our October retreat?” and received the Four of Air. What do YOU see in the Four of Air that pertains to our October gathering? I’d love to read your impressions! offer and receive love gracefully and freely. 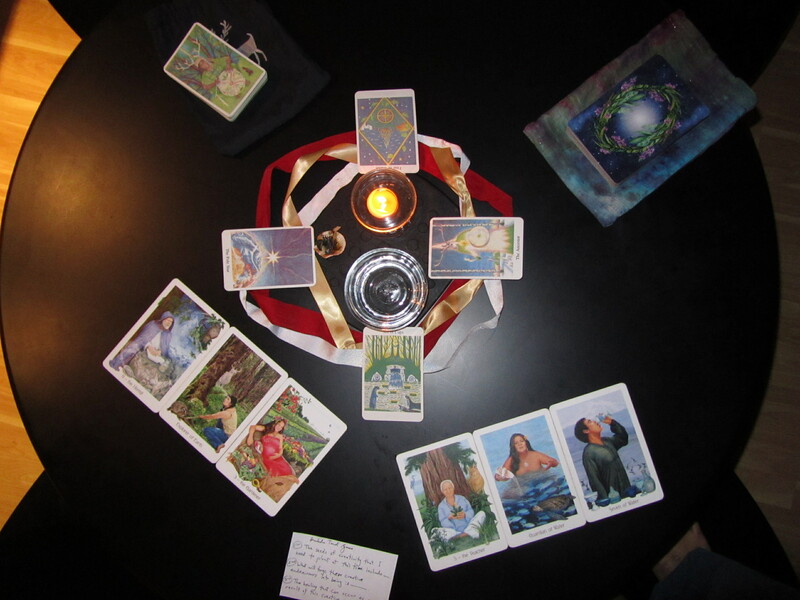 At the end of their tarot consultations, I often take people through a brief, simple, yet deeply empowering process. I also do this for myself after exploring an important issue through the cards. 1. Keep a copy of the card where you can see it often. 2. Once in a while, simply look at the card image and breathe it in and out of your body. Just notice it and notice your being with it. 3. Jot down three to six helpful, empowering, positive, evolved qualities that you sense in the card image. 4. Think of one concrete action you can perform — small and symbolic, big and public, or somewhere in between — over the next 24 HOURS that would look or feel like the qualities you named in #3. 5. Think of one concrete action you can perform — small and symbolic, big and public, or somewhere in between — over the next WEEK that would look or feel like the qualities you named in #3. 7. Allow the next right thing(s) to emerge from the actions in #s 4-6. Last night, Cyrus and I played the tarot game I created for Imbolc. Each of us received gentle, down-to-earth insights and enjoyed the conversation that emerged from these. Blessed be Brigid! Here are a couple of photos. The cards decorating the middle are from the Greenwood Tarot and the cards we used for the game are from the Gaian Tarot.